Becoming a boilermaker seems natural for a child who often rode the rails and whose father worked for the Pennsylvania Railroad. For Tim McGinley, though, the title came with a capital “B” as he took to the Gold-and-Black’s basketball court, earned a chemical engineering degree, and tallied 20 years as a Board of Trustees member. With a knack for math and chemistry, a basketball scholarship and ROTC enrollment papers under his arm, J. Timothy “Tim” McGinley (BSChE ’63) left Indianapolis in fall 1958 for Purdue University. It was the first of countless trips he’d make to campus, even long after graduation. 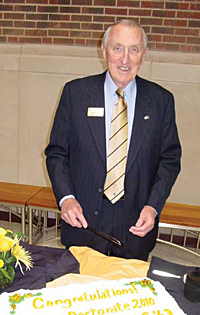 Among them: In 1972 for the Distinguished Engineering Alumnus Award; 1983 as an Old Master; 1989 for his first of 20 years of Board of Trustees meetings; and 1994 for the Outstanding Chemical Engineering Alumnus Award. His career path took him to government service, corporate leadership and entrepreneurial ventures, including Indianapolis-based House Investments Inc., a real estate investment firm he founded in 1978 that has sponsored projects in a dozen states. McGinley and his wife, Jane, also a Purdue graduate, have pledged $2 million to the Purdue Opportunities Award Program, which provides scholarships to income-eligible students.